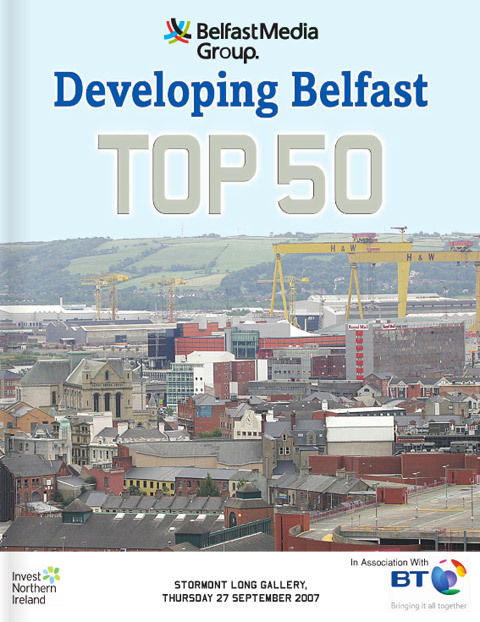 Belfast Top 50 go for it! Over 150 people gathered to see 50 of Belfast’s top businesses pick up awards during a ceremony in the spectacular surroundings of Stormont Buildings last Thursday. Fifty individuals and companies who pioneer business in developing areas of Belfast, including, titans of industry; Sir George Quigley, Chairman of the Industrial Task Force leading the corporation tax campaign, David Horgan, CEO of multi-inational Petrel Resources Plc, and local hotelier Howard Hastings, joined start-up entrepreneurs like David Kerr from For Cod & Ulster chip shop, in receiving the accolade of being amongst this year’s Developing Belfast Top 50. The impressive backdrop of Stormont was splashed with a dash of colour as one of this year’s honourees; Joe Lavelle arrived in style on one of his bright red double-decker tourist buses. Parking up outside Stormont Mr Lavelle, founder of Belfast City Sightseeing had plenty to celebrate, as he was one of the recipients of BT’s Outstanding Achievement Awards in recognition of his entrepreneurial spirit in creating a business which taps in to the changing face of Belfast. Also picking up a BT prize was Andrew Haley from Paul Hogarth company the firm responsible for designing major landmarks around the city, including Custom House Square. Presenting the winners with their Cavan Crystal vases, Tom Carson, Managing Director, Corporate & Government Solutions at BT praised the local companies. “Small businesses are the lifeblood of our economy and the Developing Belfast Top 50 is key to identifying this entrepreneurial talent in every part of Belfast. “It is vital to applaud their determination to succeed, celebrate their ideas and capture their entrepreneurial spirit,” he said. UTV presenter Ivan Little compèred the Belfast Media Group event, hosted by the Enterprise, Trade and Investment Committee. Speaking at the event he welcomed the business people gathered by acknowledging their “great entrepreneurial trait” of “being wealth creators”.